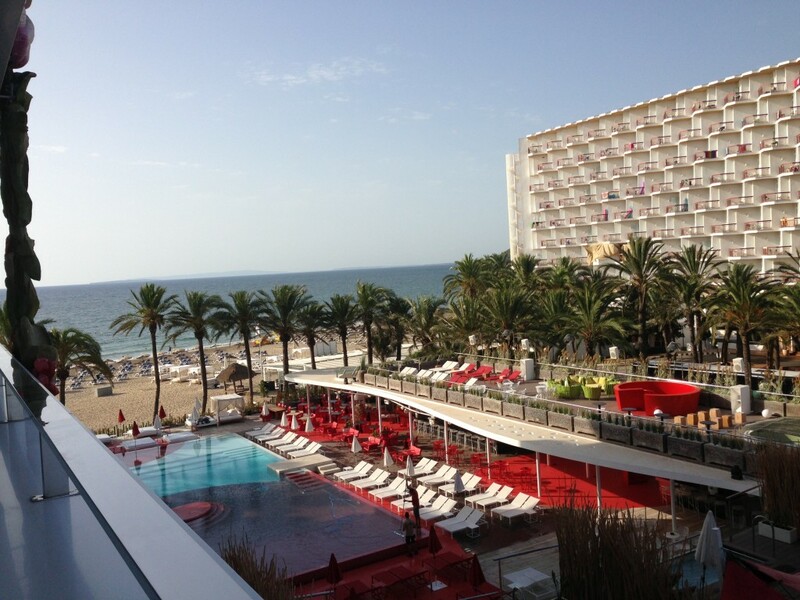 The European leg would not be complete without a stop in Ibiza – one of our favorite places. Many know Ibiza as a party island – and it is that, but there is so much more. On our third visit, we explored intimate coves, anything-goes beaches, world heritage sites, salt flats, underwater wrecks, an ancient cave, and of course – the nightlife. Playa d’en Bossa (where we stayed): The longest beach on the island, close to Evissa, with a lot of activity. The beach is lined with hotels, flats, and restaurants. It is also home to Bora Bora – a fun club with free admission where you can dance in the sand. Part of the beach has a boardwalk and you can also catch a water taxi, ferry, or party boat. Free street parking. Aguas Blancas (our favorite): Long, narrow cliff side beach with great views and lively waves. This beach is so cool because of the scenery – pick a spot up against the cliff and you will have natural shade in the afternoon. This is the kind of place where you can bring a cooler and spend the day. There is also one restaurant/bar with restroom. Tip: wear good shoes because you must walk down a long, winding road to get to the beach. Paid parking. 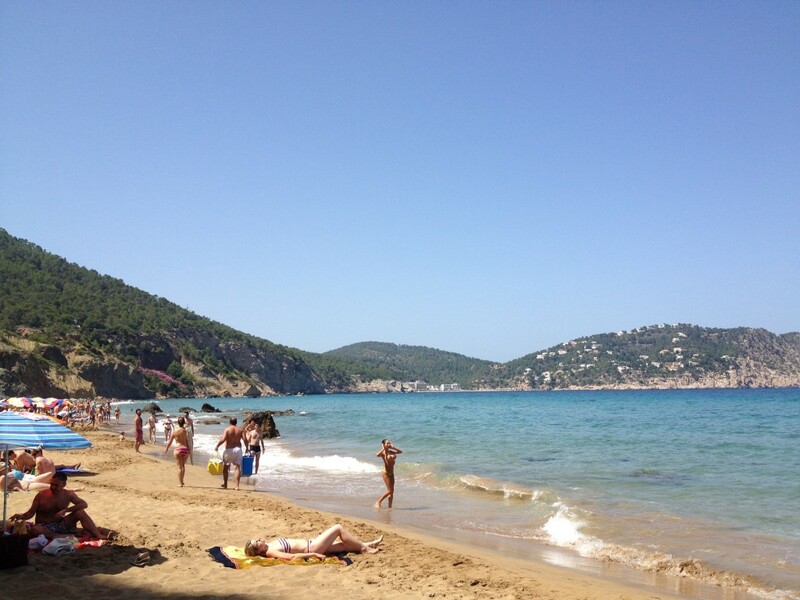 San Antoni: Long, wide beach with promenade in the town of San Antoni. 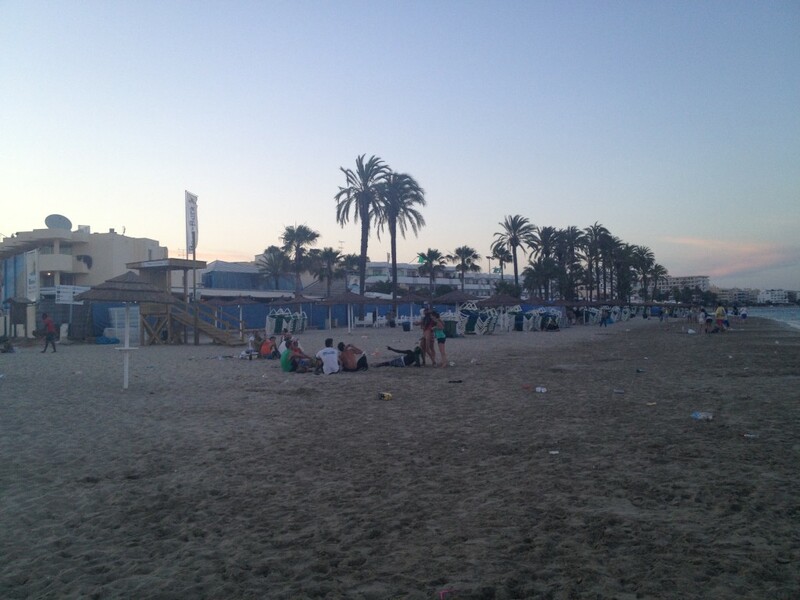 This beach is lined with restaurants and bars and is fun place to bar hop and people watch. The crowd is mostly young tourists. Paid parking in town. Las Salinas: Long, wide beach on the southern part of the island close to Evissa. It is one of the more popular beaches and crowded with people of all ages. 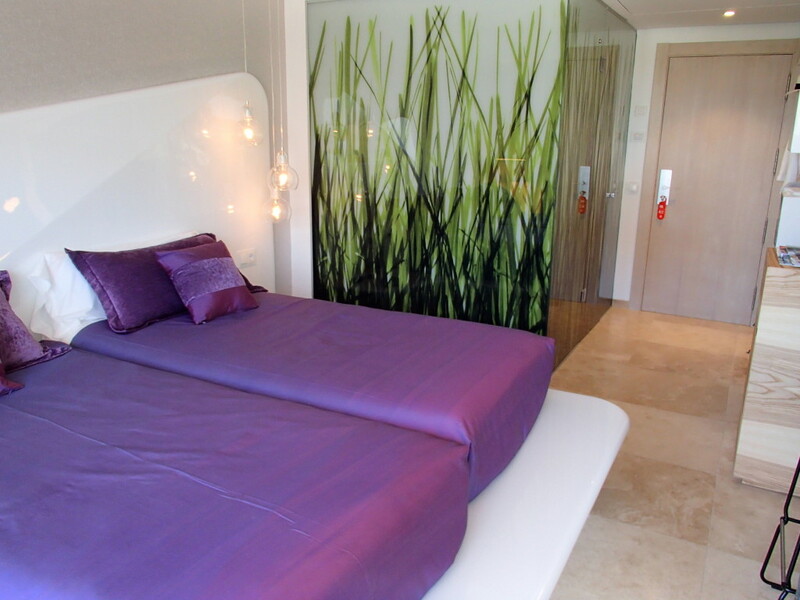 There are several restaurants and bars – we asked the cost for a daybed at one (E50) plus food and beverage. While it was hard to find a spot to sit, it was entertaining to watch the club street teams. Paid parking. Calla Vadella: Intimate cove surrounded by green hills with calm, clear water. To get to this beach, you drive down a narrow, winding road. It is a quiet, low key area with couples and families. There are a few cafes and shops adjacent to the beach. Free parking. Santa Eulalia: Borders the town of Santa Eulalia, one of the island’s largest towns. Mid-size beach with promenade, restaurants, and a fountain. Low key atmosphere with families and tourists (mostly over 30). Free street parking. 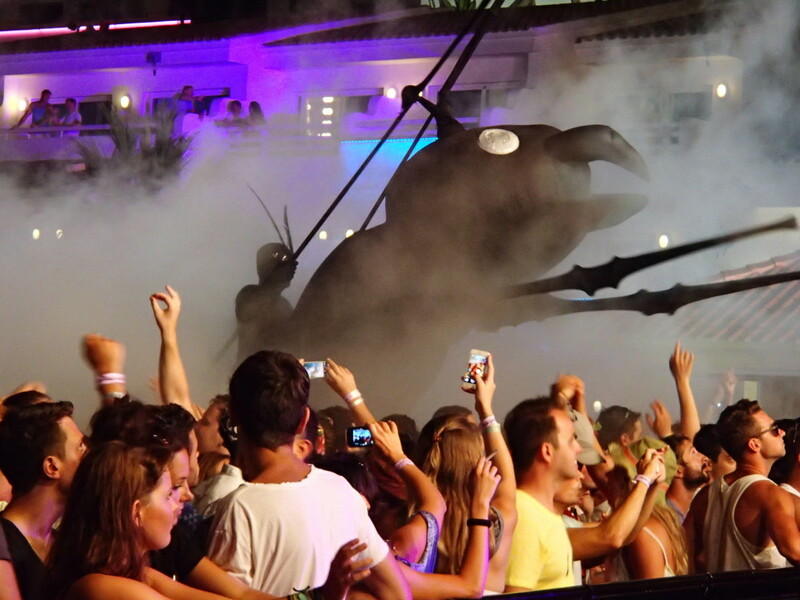 There is much more to Ibiza than beaches and clubs. The inland areas have pine forests and winding mountain roads leading to small, quaint villages and other interesting sights. 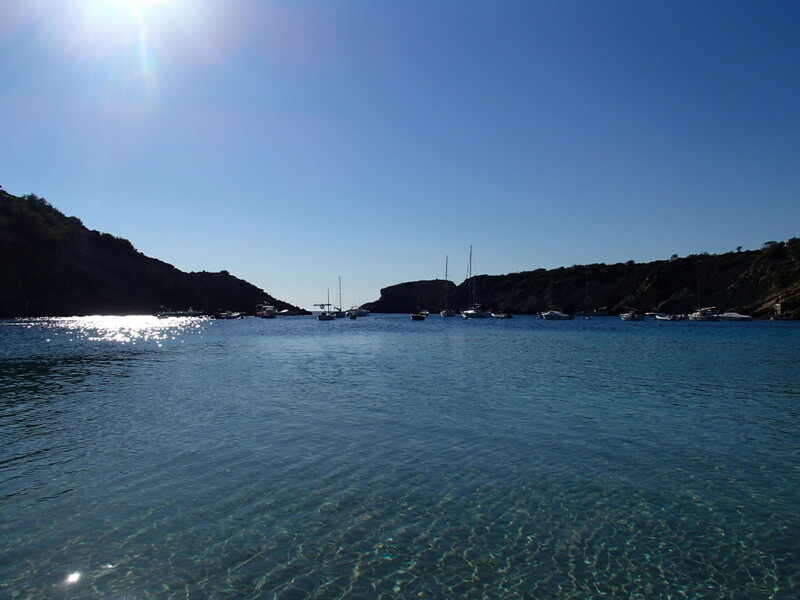 Did you know that there are several UNESCO World Heritage Sites in Ibiza? 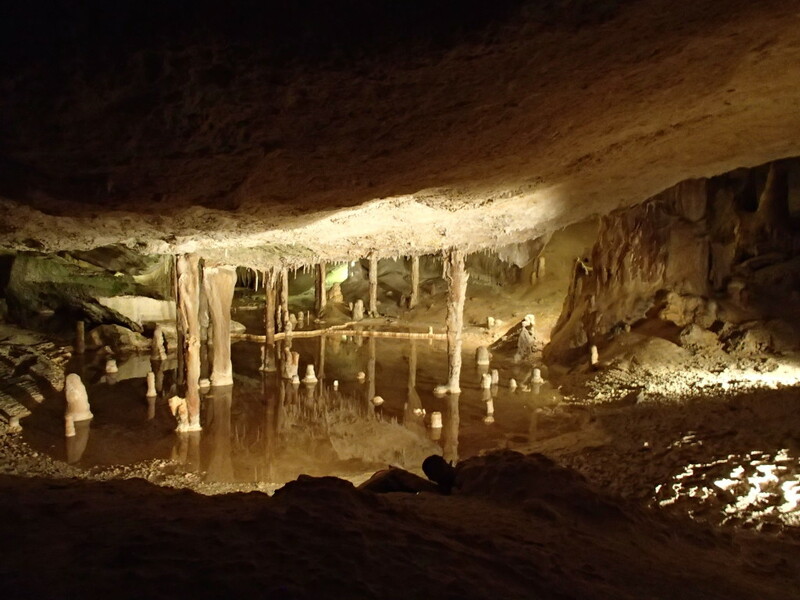 Cova de Can Marca is a 100,000 year old limestone cave with underground lakes, stalagmites, and stalactites. Years ago, smugglers discovered the cave and used it to hide their stuff. It costs E10 per person for a 45-minuted guided tour, which starts with a walk down the base of the cliff overlooking the stunning Port de Sant Miguel bay. This small ruin of an 8th century BC village is located on a cliff adjacent to Sa Caleta beach near the salt flats. There are remains of streets, public areas, and buildings. 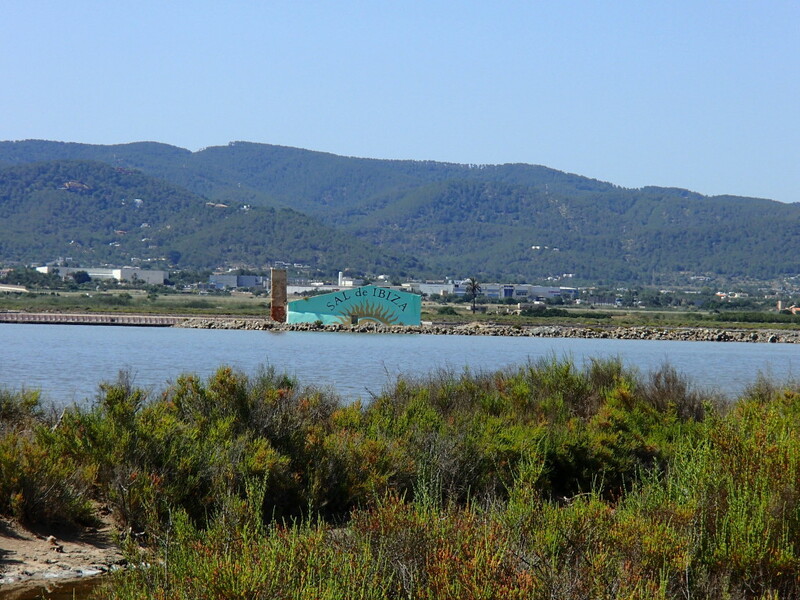 The inhabitants abandoned the area to move to what is now Ibiza town (Evissa). 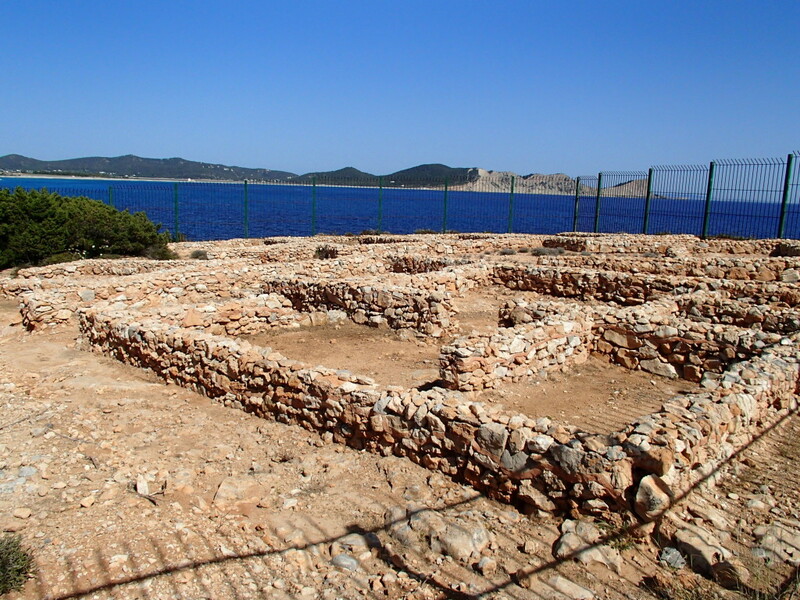 When the Phoenicians settled in Ibiza, they started harvesting salt on the southern end of the island. Today, a private company owns the salt flats in Ses Salinas (see Shopping section). 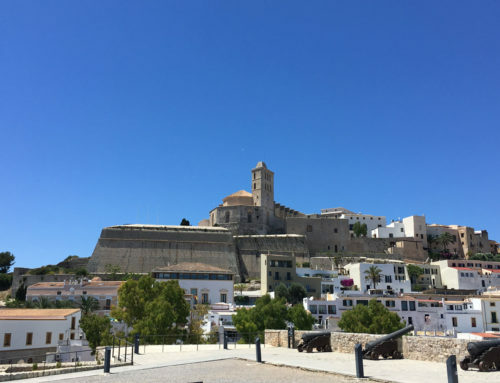 Eivissa is one of the oldest towns in Europe – the Carthaginians built it in the 7th century BC. 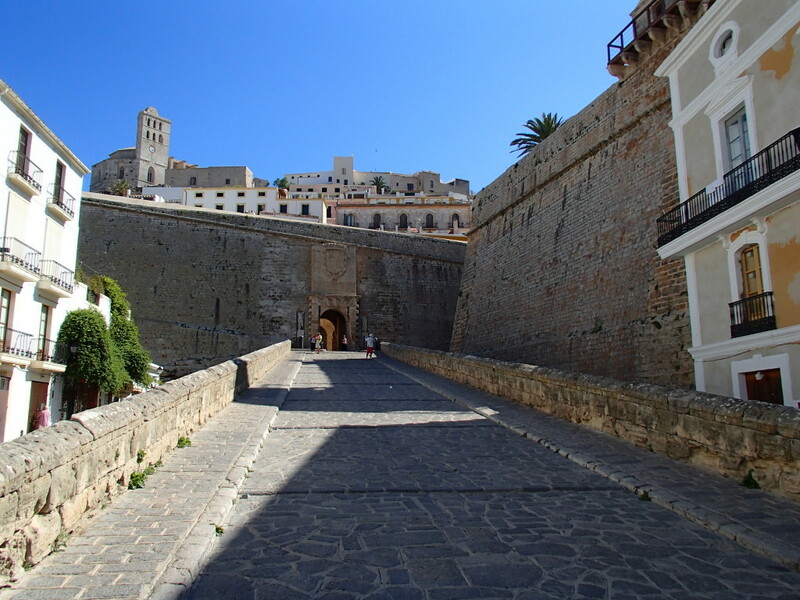 It is fun to explore the narrow passageways and old buildings in the old town (Dalt Vila), which is surrounded by a large stone wall built during the renaissance. We passed through Sant Joan in the afternoon of our northern island exploration day at end of the Mercadillo Sant Joan (Sundays 10:00 – 15:00). 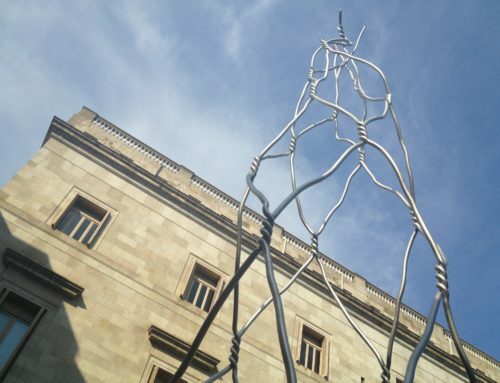 We saw people breaking down art booths and cleaning a gigantic paella pan. It looked like a nice way to spend a Sunday afternoon. Michael went on a dive with Punta Dive just off the coast by Playa d’en Bossa to see one of the biggest wrecks in Europe. This was his first deep water dive (47 meters), so he was accompanied by an instructor who guided him. The wreck was a ferry, Don Pedro, which hit the offshore rocks and sank in 2007. There is still cars and cargo inside, but it is too dangerous to retrieve anything. During the dive, Michael also saw lobster, jellyfish, octopus, barracuda, and eel. The Hippy Markets are a long standing tradition that go back to the 1970s. There are two big markets on the island: Las Dalias in San Carlos on Saturdays and the Hippy Market at Club Punta Arabi in Es Caná on Wednesdays. We went over to Punta Arabi and it was a fun way to spend a few hours. There are booths with jewelry, leather goods, and clothing; along with food and live music. We also saw two really good local bands. Evissa is the largest town on the island, so it has the most shopping. There are lots of cute boutiques throughout the town. Lori couldn’t resist getting a few things at A-List (we love a shop that has a bar inside). 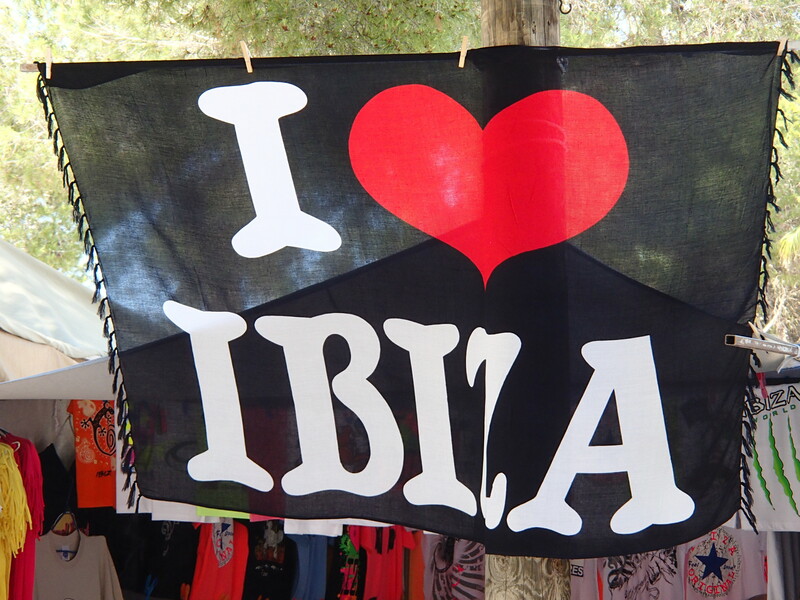 Here’s a good Ibiza Shopping Guide. Michael is a salt freak (he puts it on just about everything) and has amassed quite a collection. Sal de Ibiza is one of his favorites. You can buy it online and at stores in Europe (we saw it in Madrid, Barcelona, and Paris), but he couldn’t pass up the opportunity to shop at the main Ibiza store. This is not just a salt store – there are really cute ladies clothes, hats, scarves, and beach bags. 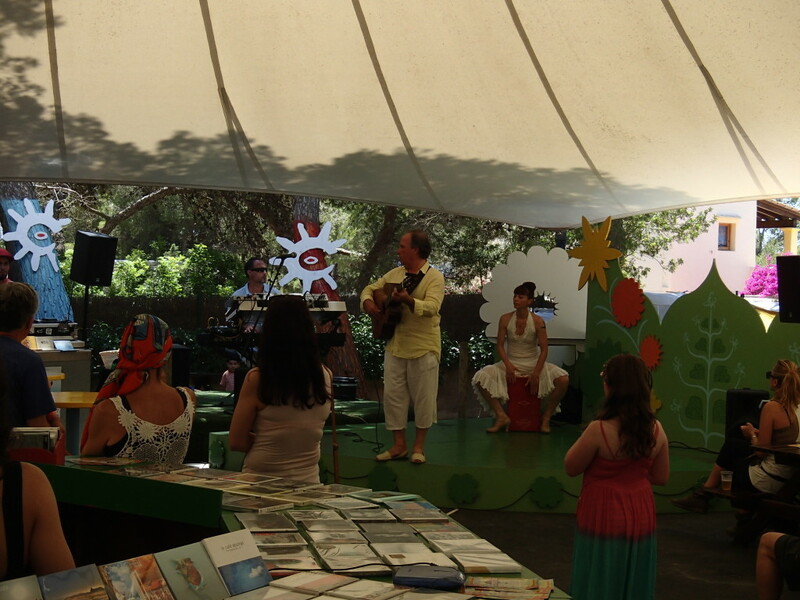 It is worth a stop if you are passing by the road between Evissa and Santa Eulalia. The western side of the island has some of the most spectacular sunsets in the world. 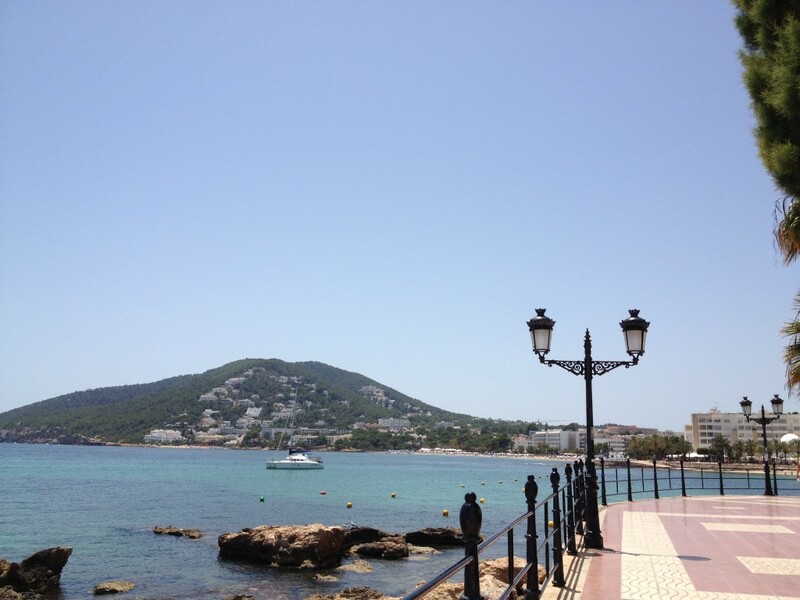 A popular spot to see the day off is the town of San Antoni – especially the promenade by Café del Mar. Everyone claps when the sun says adios. On this visit, we decided to focus more on sightseeing than clubbing. Most clubs don’t open until midnight, so we would end up staying out all night and sleeping during the day. But we did go to a club on Lori’s birthday. Lori was thinking Pacha’s Flower Power party would be a blast, but we already celebrated Lori’s birthday at Pacha on our last visit. 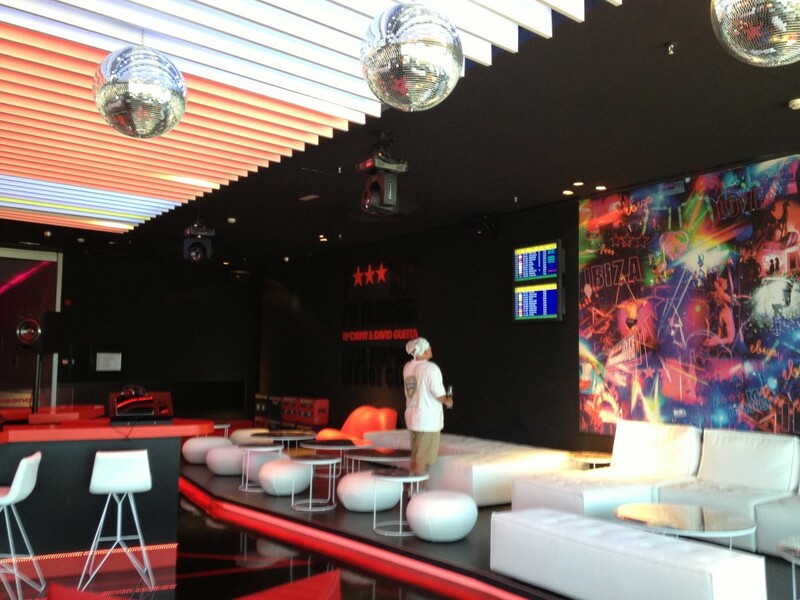 And, we were feeling lazy, so we walked over to one of the nearby clubs – Space. 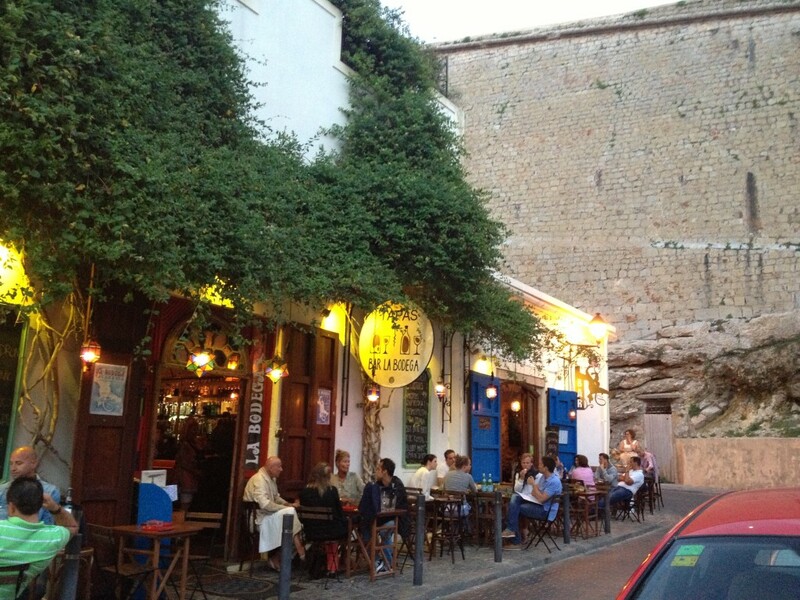 La Bodega: We loved this tapas restaurant at the base of Dalt Vila in Evissa. Fun eclectic décor; yummy food; and fast, friendly service. 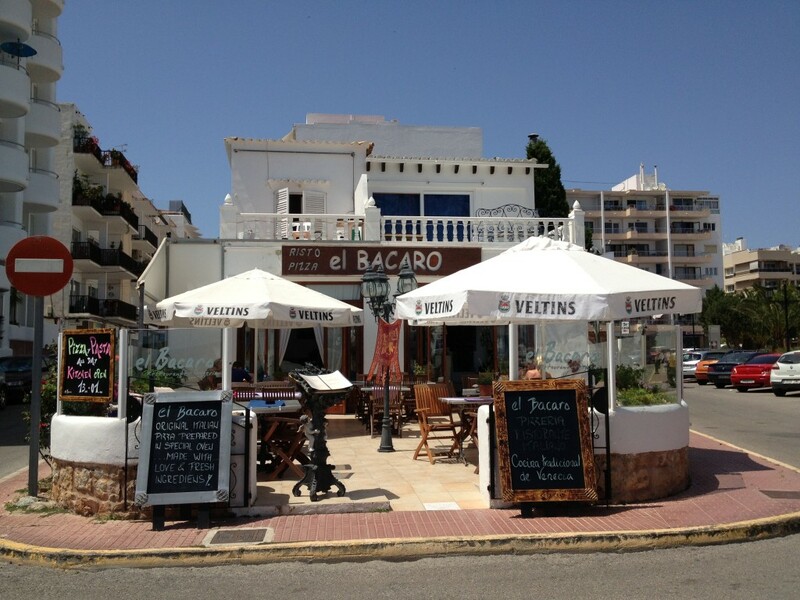 El Bacaro: We stopped at this cute restaurant at the Sant Eulalia promenade for a coffee and lemon sorbet (served in a lemon skin), but wish we had been hungry to try the delicious looking homemade pizza. Have you been wondering about naked pirate man? On our last night, we took a walk on Playa d’en Bossa beach and stopped at Bora Bora to listen to the music. Then we saw him – an extremely tall, skinny guy with dreadlocks and bandana, and tattoos on his legs. His attire was a red long sleeved flowing shirt and a see through mesh thong that showed off his huge @&%$. He walked in circles around the beach until people took notice – and then off came the thong and he started to dance – well, gyrate. As people stared to take photos, he posed and danced with everyone who seemed interested – girls and guys. Lori was amused; Michael was disturbed. Since Michael had the camera, we only got one photo from a distance after he finally let Lori use it. 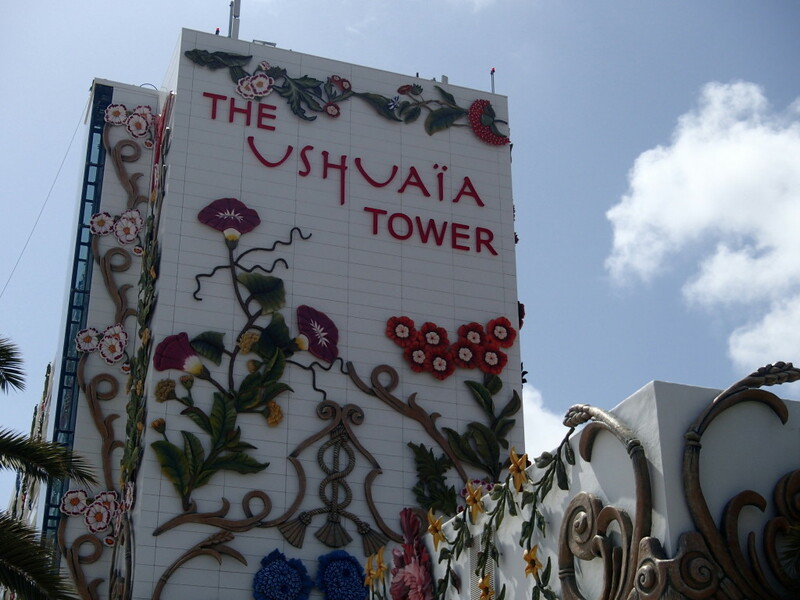 After passing by naked pirate man, we walked over to Ushuaia, one of Ibiza’s newest hotels /clubs. We had walked by a few nights earlier and there was a party with DJ at the beachside patio. But this evening, there was a big event at the pool. We peeked through the walled off area and saw a huge stage with light show by the pool – and the music was awesome. At the front of the hotel there were dressed up partiers entering the main gate. We popped into the gift shop and Michael asked about the party. It was the opening party for Departures, which goes from 5:00 PM – midnight. At the time it was 9:00 PM – we contemplated going, but were wearing our grubby clothes and hadn’t showered yet (no judging). If we ran home and cleaned up, we would only have two hours tops to enjoy the E50 per person party. What to do? We decided to go back to Ibiza after Barcelona and stay at Ushuaia for a few days so we could enjoy Departures and their other parties. So, stay tuned for Ibiza Replay in August. We typically post a review on Tripadvisor, but this flat is not listed on the site (the property management company has a few of their other flats listed). So, here is a review of the flat. 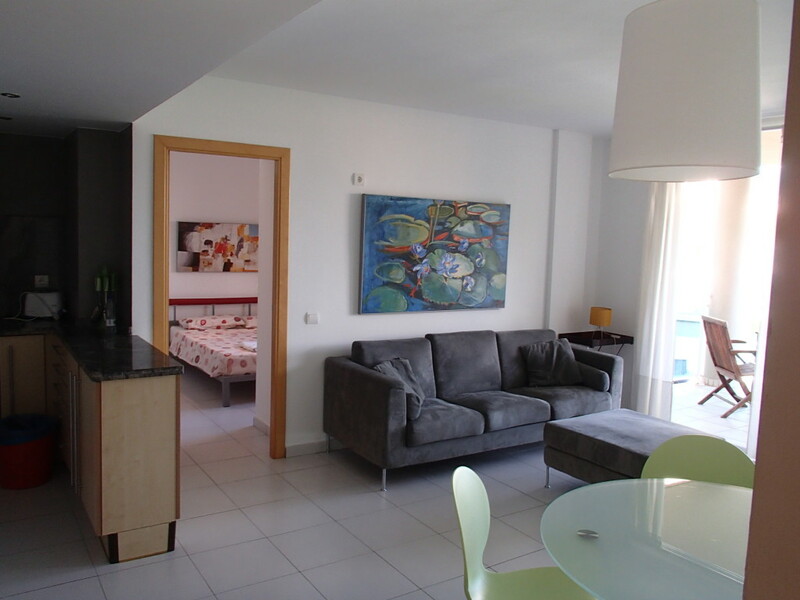 The flat is in a great location right on Playa d’en Bossa. The market and bus stop are around the corner; you can walk to Space, Ushuaia, Bora Bora, and tons of restaurants and bars. 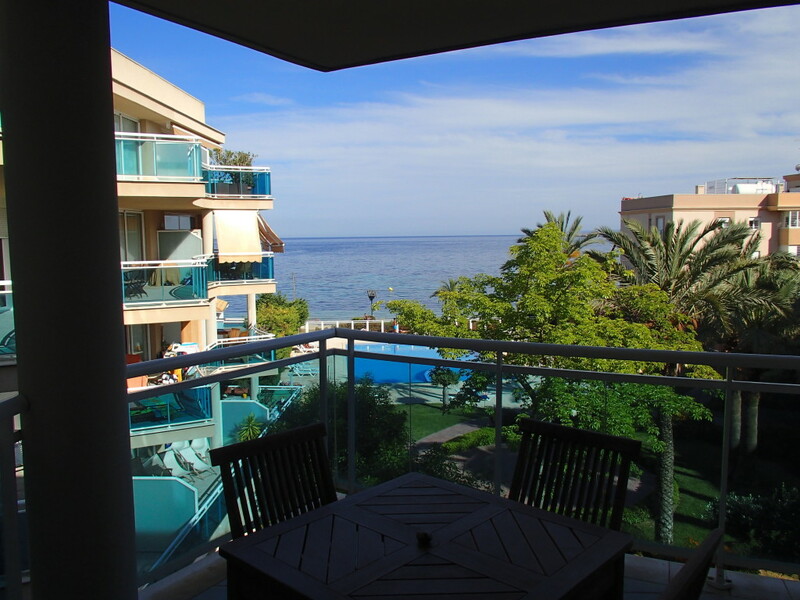 The flat has a nice balcony with sea view – you can even hear the sound of the waves. But, there are some issues. The building is loud: the walls are thin and you can hear people next door and above, one flat has two dogs that bark a lot (we didn’t mind, but others may), the building is in the airport flight path and the planes fly low over the area until past 1:00 AM (again – we didn’t mind, but others may). The bed is one of the most uncomfortable we slept in during the past four months – the mattress and pillows are hard a rock! The master bath shower is gross – the grout needs a steam cleaning. The hot water lasts less than 5 minutes, so you need to shower quickly. The safe was broken and some of the lamps did not have light bulbs. The wi-fi is incredibly slow and unusable at night. When you book, you pay a 50% deposit by PayPal and must bring the remainder, along with a E300 deposit, in cash to check in. So if 2 bed / 2 bath flat in a convenient beachfront location is what you seek and you don’t mind some of the shortcomings, you may like this flat. 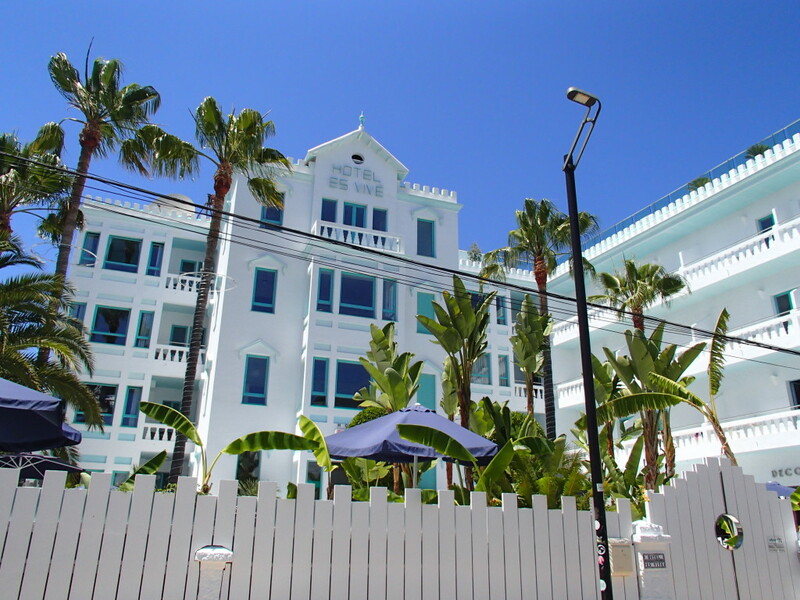 On our last visit, we stayed at a hotel – es Vive. 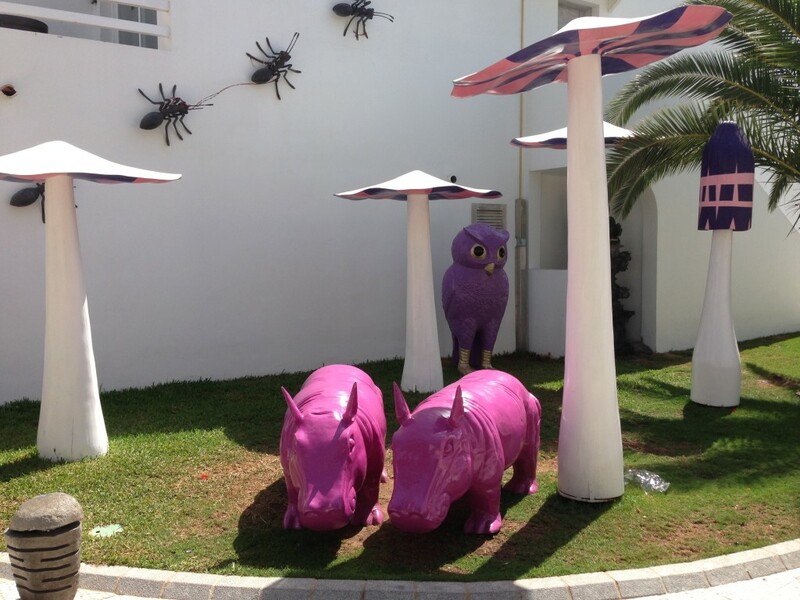 This is a very cool hotel one block from Playa Figueretes (a small beach a few minutes walk from Playa d’en Bossa). The rooms are super small, so we stayed in a suite (which is really just a larger room with couch and desk). The pool area is fun and the restaurant has yummy food. One night, there was a fashion show poolside. Since we were there, they built a roof terrace. Clubs: You can buy tickets at the door or online in advance to skip the lines. Rent a car: There is a lot more to see in addition to the beaches and clubs. Rent a car and explore the winding forested hills, inland towns, and small coves. Beach parking: Some beaches have free parking and at others you have to pay (typically E3 – E5), so bring some cash. At some of the beaches with paid parking, you may be able to find street parking further away, but these spots fill up quickly. Town parking: Some towns have free parking and others have metered spaces on the street and/or lots, so be prepared to pay if needed. Parking ticket alert: we got a parking ticket in Evissa, even though we put money in the meter, displayed the ticket on the windshield, and returned well before the time expired. This really stunk! See the post, Ibiza Parking Meters for full details. 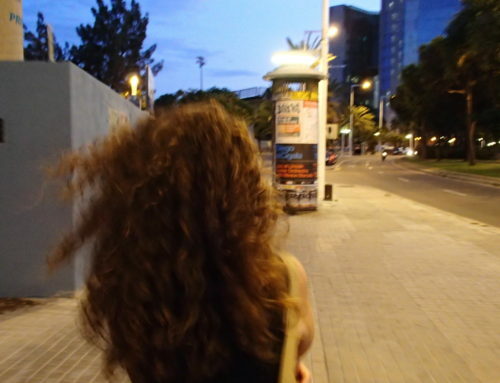 After spending six weeks in Barcelona, we headed back to Ibiza to stay at Ushuaia for four days During this time, we did absolutely nothing except walk on the beach, sit in the pool, and go to the parties at Ushuaia (admission is free for hotel guests). The main part of the hotel, the Club, opened a few years ago. But the Tower, where we stayed just opened in May. We love, love, love the eclectic design of the hotel! The predominant style is modern, interspersed with Asian, tribal, and whimsical accents. There is a giant Buddha head outside near the front of the Tower. Neon colored critters perched on the roof look down on the Club pool. 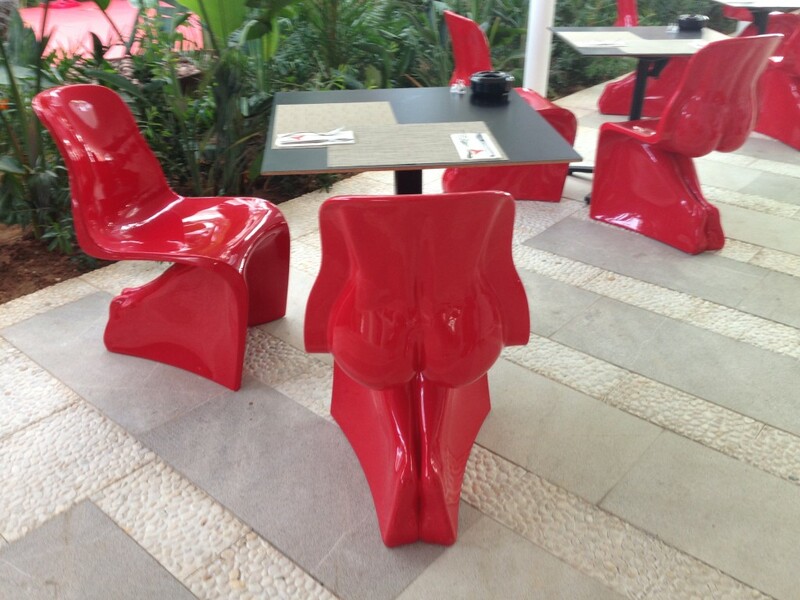 Check out the design of the chairs…. We went to Departures, Bazaar, and Ants. Our favorite music was during Departures. Part of Le Grand Bazaar was broadcast live on BBC Radio 1. The performers at Ants were cool; we also love the funny promo videos for the party.